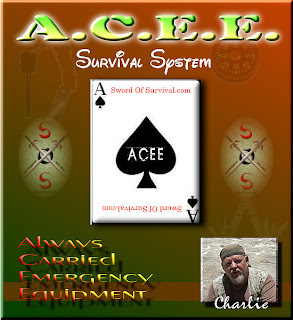 ACEE stands for Always Carried Emergency Equipment. ACEE is a concept that I have developed to educate others on the need to always be prepared for emergency situations, whether urban survival scenarios or wilderness survival scenarios. 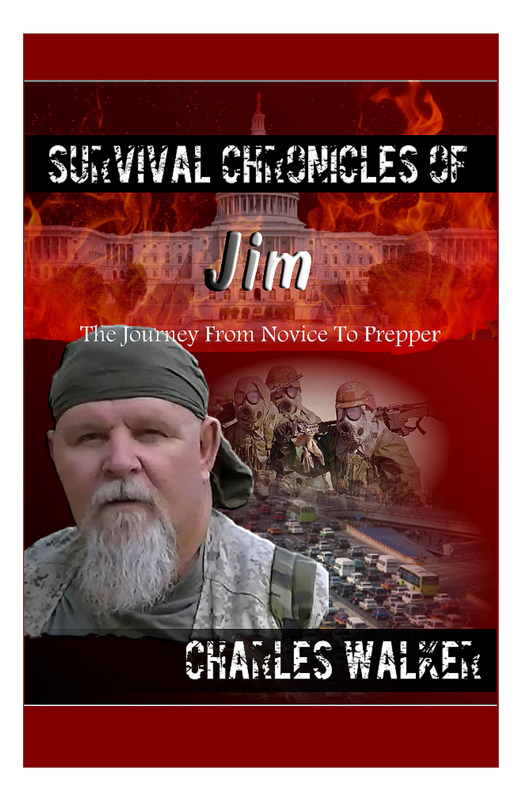 Many laugh at those of us who feel it is necessary to always be prepared for the worse case scenarios and yet those doing the laughing are usually those who are found to be hurt, killed, lost or unprepared in a survival situation. So I say let them laugh, but when the time comes those still alive can thank themselves for being prepared. I think there is an old saying that goes something like, "Chance favors a prepared mind. ", or something similar to that. The ACEE system is very basic and simple. ACEE is what you should carry on your person (not in a bag that can be left behind somewhere) at all times when you are away from home or your vehicle. 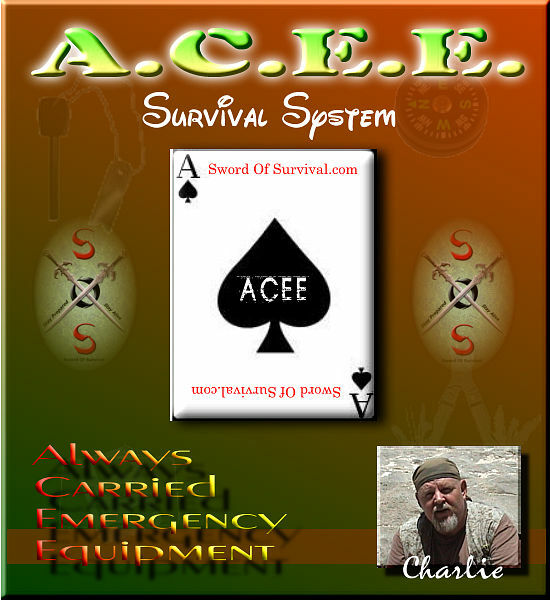 ACEE is also what you should carry in a vehicle, boat, or aircraft that stays in what ever mode of transportation you have. ACEE is similar to EDC (Every Day Carry), but I thought the term too vague, because to me my wallet, cell phone, car keys, money are everyday carry items, but may not relate to survival equipment. In other words, ACEE should complement or extend your EDC. Once you get used to carrying the items that I mention in the ACEE system, it will become second nature to the point you may feel naked without them. ACEE system items are small and the way they are carried do not take up much room on your person or vehicle. If you noticed I have not mentioned the home as being part of the ACEE system. This is because home is your primary base. All your survival emergency equipment are normally stored at home and normally if you are at home, you already have access to your equipment. Your bug out bag becomes your survival means, along with your ACEE, when you have to move out for some unknown reasons, such as a tornado, hurricane, riots, etc. The ACEE items I have chosen to be carried on your person are small, but yet very versatile in getting the job done. Kind of a micro system of survival gadgets so to speak. If you like to carry larger items and are comfortable with it, go for it. These items are what I deem the basics. You can add to it to your liking or substitute items. The ACEE system can be adapted to what ever your daily wear may consist of. If you have a job that requires you to wear a three piece suit or a dress, this system will still work. Although, those wearing dresses will have to carry their ACEE in a purse. The items in the ACEE system are designed to cover the needs for fire starting, signaling, navigation, cutting, light, cordage, first aid, and physical protection. Items can be carried on person that will cover each of these needs. I did not mention shelter, food or water because with the ACEE system and some basic knowledge, you can obtain or build these resources. Common sense dictates that you always be dressed for the season you are in or the region you are traveling to and from. For example, don't leave home in the winter without a warm jacket and a small portable poncho that can fit in the jacket pocket. Or even better, a winter jacket that is water proof with a hood. Get the idea? fake wallet (optional)- in then event you are being robbed. This list looks long, but when you actually have them stored on your person they do not take up a lot of space. The more survival techniques that you can learn and master, the less equipment you don't have to carry. For instance, if you can start a fire by rubbing two sticks together, then you are better off in the event you forgot your fire starting aids. By knowing how to start a fire, you can make a torch in the event you don't have a flashlight. If you know how to knapp stone and make stone cutting tools, then you can get by without your knife. Are you seeing the overall picture here?